On January 19, 2017, I wrote about SpaceX's Falcon 9; now we have "Mr Steven" docked on Terminal Island. 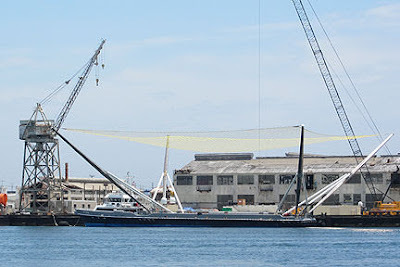 Yes, Mr Steven is a strange name for a recovery vessel which will be used to catch the cast-off rocket fairings. In April, the Port approved a 30 year lease on Terminal Island for SpaceX to build a manufacturing plant which will create it's future mega rocket. 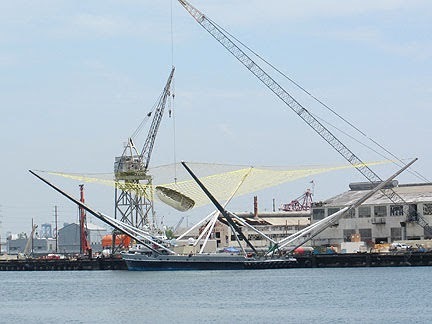 This is where Mr Steven is docked. Weighing nearly 200,000 pounds and 200 feet long, it has been seen making impressive aggressive turns and sprints up to 20 knots (23 mph). 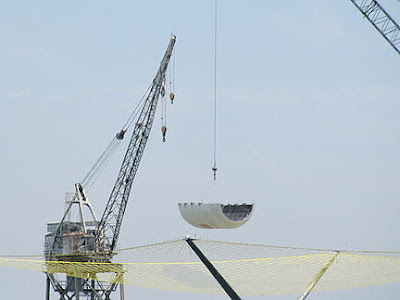 A test run took place yesterday and it must have been successful as we spotted them unloading a fairing. 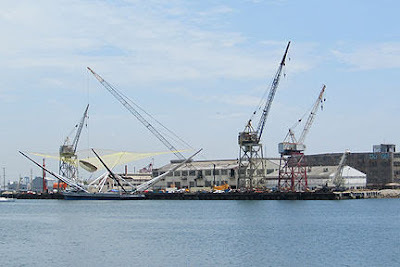 Update: In January 2019, SpaceX pulled out of the Terminal Island lease, deciding to move the building of a rocket to Texas.